Howard Hughes Corp.'s latest designs for the Pier 17 mall. Howard Hughes Corp. has rethought its proposed shopping mall on Pier 17. The latest concept splits the mall building and its roof in two, opening up the ground floor to natural light as well as the weather. "So when it rains the rain will come down right through the middle of the building," said Gregg Pasquarelli, a partner in SHoP Architects, the building's designers. "We think that would be pretty fantastic and really have this great engagement with the waterfront." Pasquarelli presented revised renderings of the building to joint committees of Community Board 1 on Thursday Oct. 4, as part of a city approval process it must go through to gain a number of zoning and other land use exemptions. The company has yet to commit to the newer design, which does not require approval by the board. The Landmarks Commission had approved most aspects of the building's exterior in May and will look at signage and other parts of the plan on Oct. 23. 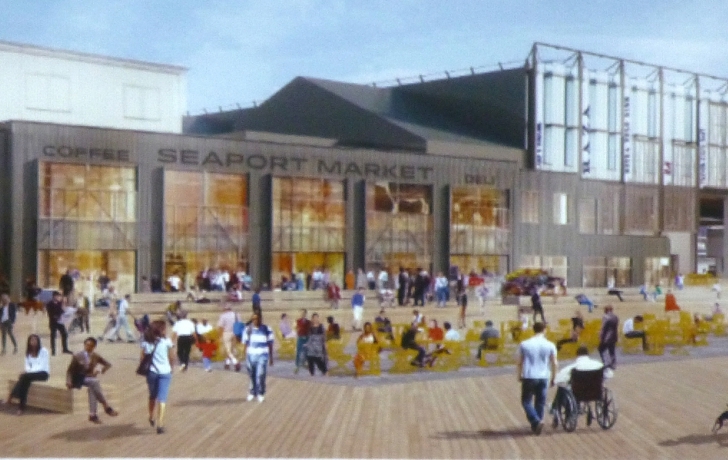 The architect also showed SHoP's latest design for the Link Building, an extension of the Pier 17 structure at the southwest corner of the pier where Hughes plans to house a food market. The Landmarks Commission objected to a previous version of the building because it obstructed the historic Tin Building, next door .The new design calls for a section of the building to be demolished and glass added to its doors and windows. Hughes executive vice president Chris Curry told the board that they have yet to find a tenant that will run the market. "We've begun discussions with other local [food market] operators who share our vision," he said. Robert Lavalva, founder of the New Amsterdam Market, has rejected Hughes's offer to house his popular weekly market in the Link Building and is instead seeking to put the New Amsterdam Market in the Tin Building and New Market Building. Hughes now has the option to propose development plans for those buildings. Many questions remain over the company's future plans for the Tin Building, New Market Buildings and other city-owned Seaport properties. The board also has yet to vote on Hughes's current land-use applications to the city. But the looks of the project got high marks from several board members. "I want to commend you," said Harold Reed, a member of the board's Landmarks Committee, "because I think it's stunning. Really stunning."